I knew that if I didn’t topdeck a Revoke Existence or a Return to Dust I would not get another turn. 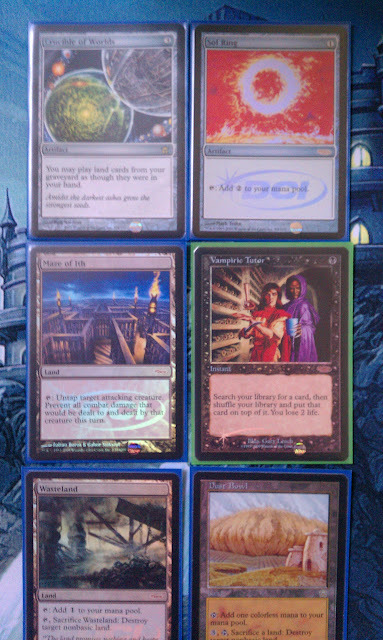 I had only five lands out, too little mana for a more drastic solution like Planar Cleansing. I eyed the Survival warily. Normally Adam would restrain his inner Spike until the game had gone on much longer, but I knew his shiny new Necrotic Ooze combo was too much to resist. He would probably combo off turn six just to prove that he could. The other players at the table weren’t going to be much help. My dad was too busy setting up for Thraximundar, and Mike was biding time until he drew the True Conviction that would make his UWB fliers truly terrifying. They were not expecting an early combo win, because even the biggest Spikes in our playgroup normally wait until the late game to go off. It’s part of our unspoken gentlemen’s agreement. This game was different, though. All the combo pieces had fallen in his lap. The early game Fungal Reaches would provide the extra mana necessary to go off this early in the game. He hadn’t even needed to tutor for the Survival. I drew my card — a plains. Feeling annoyed, I passed turn. Adam untapped, tutored up the chain of creatures he needed, and killed us all with infinite suicidal Oozes (Losing to Mogg Fanatic is humiliating, by the way). I started picking up my cards to shuffle up for the next game. I wasn’t upset that he had won so early; I was just annoyed that I hadn’t been able to do anything about it. Mike, however, did not take it so well. Adam proceeded to apologize for ruining Mike’s game, explaining that he just wanted to show off his new combo. Mike accepted the apology and we went on to another, much longer game. Everything was cool and everyone was happy. Which was a much better ending than this next game. 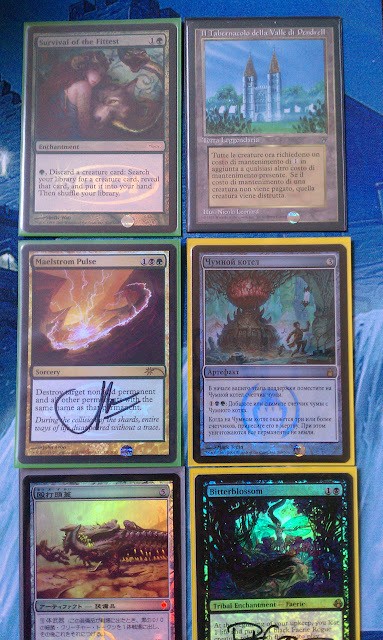 I was at SCG Dallas on Legacy day. 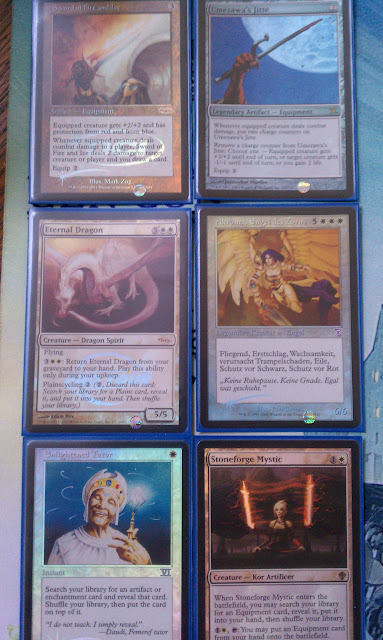 I had dropped out the tournament a few rounds in, and had spent most of the day playing EDH pods. I had played several great games. The third pod seemed like it was going to be business as usual until the Scion of the Ur-Dragon player went infinite turn five. There were muttered exclamations of “douchebag” and “jerk” all around the table. The Scion player offered to play another game, but everyone declined. The poor Scion player was called all sorts of other nasty names, and there were several accusations that he had violated “the spirit of the format”. That is what the Internet does to people. It turns them from polite, rational human beings into an angry mob of nerdrage. It also creates a large community united by their mutual enjoyment of Magic. So which, in the end, is better for the format? I’ll start with “teh internets”. The Internet is a place for the exchange of information. EDH players get online to talk about a wide variety of subjects. On MTG Salvation (MTGS), the threads about card choice range from those devoted to a single card to archetypes and deck lists. This helps players to streamline their decks and share tech. I’ve even seen threads devoted to making decks less cutthroat. Such an exchange allows players all over the world to have a better EDH experience, no matter what their play style. The Internet is the place where Commander players can talk about their decks to people who are actually interested. Your girlfriend probably doesn’t care about that Japanese foil you spent $70 dollars on, but we do. The Internet is also home to tons of great Commander content such as articles, comics, and podcasts. There is even a thread on MTGS completely devoted to proxies (even those of you who hate proxies should check it out, because the Photoshop pros that live on the thread also make amazing tokens). The Internet is a place for the flaming, insults, and rants. As Andy is so fond of pointing out, most of us take this format way too seriously. I can’t speak for the official Commander forums, but I know that MTG Salvation is definitely proof of that fact. So many threads that had great potential for discussion have been locked because they broke down into childishness. A lot of people get on the Internet to rant about bad play experiences, which normally leads to even more ranting and hurt feelings. Speaking of hurt feelings, another thing forum dwellers love to do is harass members of the RC, Sheldon in particular (although I know there are some who would argue that this is a good thing). This pastime has not gone over well with the RC. I’m not quite sure why, because I think that “You guys are idiots. Unban my favorite card plz?” is an example of truly great rhetoric. Players who haven’t spent much time on the Internet, on the whole, tend to me a lot nicer and more laid back. The Internet comes with its own propaganda, such as “EDH douchebag”, “spirit of the format”, and “social contract”. People who haven’t been exposed to this language have to take the time required to formulate a complete thought, because “jerk” doesn’t come with a host of implications and accusations like “funwrecker” does. My buddy Mike in the opening story was much more logical about and polite about his problems with Adam’s play style than we were with the Scion player. I think that the reason non-Internet players have to be a bit more rational is because name-calling is normally considered childish and the sign of a sore loser. The Internet condones this behavior because when the nasty words you are throwing around have a connotation that could fill entire books, it isn’t considered name calling. It’s considered a valid, logical argument. The Internet exposes you to a wider variety of players and decks. Many EDH players don’t frequent a forum or read articles, so when they come up against players who do, their decks often fall short in-game despite their best efforts. The more thought that goes into your deck, the better it will be. It’s an inescapable fact. Other than that, I really can’t complain about Commander players who don’t use the Internet as a resource. They’re still great fun to play with, and they tend to play with more unique and interesting cards. They help give the format the variety it is so famous for. The problem with the Internet is that it is a chicken and egg sort of scenario. Did the Internet make people competitive and obsessed with card choice, or did all the crazy deckbuilders just gravitate toward the Internet? I don’t feel qualified to make a definitive choice, but my bet is on the crazies finding the Internet. I mean, only insane people spend hundreds of dollars on foil and foreign cards, and MTGS has a thread devoted to it.